Domaine Serguier dates back to 1900 as an estate, when it was created by Hippolyte Serguier. Hippolyte Serguier did not need to look far for the inspiration to find a name for the vineyard. Like many people of the day, he simply used his last name and a new winery was born. However, it took until 1920 for Domaine Serguier to begin to produce, bottle and sell their own wine in the Southern Rhone Valley. The property remains in the hands of the same family today. If you’re having trouble finding older vintages of Domaine Serguier and you never see any, that is because the vineyard was leased to Pierre Usseglio from 1970 until 1997. While the current manager of Domaine Serguier, Daniel Nury took over in 1993, it was not until the contracts expired that the modern era for Domaine Serguier was able to begin. Domaine Serguier owns 7.2 hectares of vines in the Chateauneuf du Pape appellation. 6.4 hectares are used for the production of red wine. .6 hectares are reserved for growing white wine grapes. Domaine Serguier produces 2 red Chateauneuf du Pape wines and 1 Chateauneuf du Pape Blanc. Domaine Serguier Chateauneuf du Pape is made from a blend of 90% Grenache, 5% Mourvedre, 3% Cinsault and 2% Syrah. Although the blend can vary. The terroir is galets, sand, limestone and clay. Most of the grapes are destemmed. 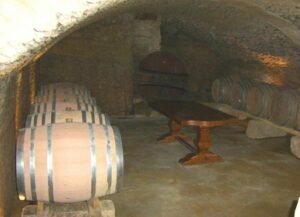 The wine is aged in a combination of concrete vats, demi muids and used, French oak barrels for 10 to 12 months. The production is close to 850 cases of wine per year. Domaine Serguier Revelation is made from a blend of 90% Grenache, 5% Syrah and various amount of Mourvedre and Cinsault. The terroir is rocks, stones, limestone and clay. The vines are planted in Les Blachieres, Pied Long, and le Terres Blanches lieux-dits. The majority of the grapes are destemmed. The wine is aged for 12 months in a combination of mostly used, French oak barrels, 30% new, French oak barrels and tank. The new French oak barrels are used for 100% of the Syrah, Mourvedre, assorted grape varieties and some of the Grenache. The grapes used for Domaine Serguier revelation come from the estates oldest vines. The production is quite small ranging from 25 cases to 75 cases per year, depending on the vintage. Domaine Serguier Chateauneuf du Pape Blanc comes from a blend of 33% Grenache Blanc, 33% Clairette and 33% Bourboulenc. The wine is aged for 6 months in stainless tanks. The production is on average close to 75 cases per year. Domaine Serguier can be enjoyed young. Young vintages can be popped and poured, or decanted for about 1 hour, give or take. This allows the wine to soften and open its perfume. Older vintages might need very little decanting, just enough to remove the sediment. Domaine Serguier is usually better with 3-4 years of bottle age. Of course that can vary slightly, depending on the vintage. In the best vintages the wine should be consumed within 4-12 years after the vintage. Domaine Serguier is best served at 15.5 degrees Celsius, 60 degrees Fahrenheit. The cool, almost cellar temperature gives the wine more freshness and lift. Domaine Serguier is best served with all types of classic meat dishes, veal, pork, beef, lamb, duck, game, roast chicken, roasted, braised, stewed dishes, sausage, barbecue and cassoulet. Domaine Serguier is also good with Asian dishes, hearty fish courses like tuna, mushrooms, cheese pasta, eggplant and tomatoes. The white wine of Domaine Serguier is best served with a myriad of different seafood dishes, shellfish, crab, lobster, sushi, sashimi, chicken, pork and veal, as well as Asian cuisine. Polished, round and with an easy to like charm, the wine is soft, fresh and juicy with a fruity, kirsch and assorted, red berry finish. Forward, easy drinking, red berry dominated wine with a lean to the lighter, herbal side of the style range. You can drink this on release. Light in fruit, with an earthy, barnyard, tart, red berry, personality that will be best in its up front, crisp youth. Modern in style, with a medium bodied, peppery character to the fruit. The texture is clearly round, but tasters are also going to find a lot of oak for the fruit in this vintage. Light, easy drinking quaffer without problems, or distinctive features. Spicy, sweet, black raspberries are concentrated and deliver a ripe and fresh sensation. The earthy berries, medium body and elegant, fresh, kirsch are already open and showing their charms. Drink this on the young side. Fresh herbs and pepper couple with sweet kirsch, soft textures and a forward, medium bodied style. From 90% Grenache, 5% Mourvedre and 5% made up from various allowable varietals, the wine opens with sweet, ripe, fresh cherries. Medium bodied and forward, this is made in an elegant, fresh style, drink this wine young. Medium bodied, forward, open and showing red fruits, a touch of oak and spice with soft, polished textures, this is probably best for near term drinking. Light in color and fruit, this easy drinking, fresh, sweet, bright, kirsch wine is already mature and while enjoyable, it is not a wine to age.